Diabetic angiopathy (for eye diseases prevention), diabetic retinopathy, retinopathy of various etiologies; Impairment of mesopic vision and night vision adaptation; Increased stresses, including photostimulation of visual apparatus (for protection of the retina from solar, computer and other types of radiation); Decrement in visual acuity, visual fatigue, eyesight strain, eye muscles asthenia; Short sight and far sight; Status after traumas and inflammatory eye diseases for acceleration of healing after eye surgeries; Age-related changes in the eye structure (vitreous body destruction, iris subatrophy etc. ); Windsurfing, skiing, alpinism (vast snow and water surfaces reflect ultraviolet rays almost completely). Lutein, vitamin mixture (viamin E, Vitamin В1, riboflavin, pyridoxine hydrochloride, ascorbic acid, calcium D-pantothenate, folic acid, nicotinamide, D-biotin, vitamin В12), vitamin C, bilberry powder (berries and springs), sugar, starch, calcium stearate, CMC. Lutein is a carotenoid, extracted from a medicinal plant – calendula. It meets daily demand of this component in the body in the macula – area of best vision, which provides for qualitative and clear vision. Lutein is selectively combined with specific retinal proteins and serves as a natural retinal screen, protecting it from effect of too bright light. It selectively absorbs aggressive part of light rays spectrum (protective screening function) and neutralizes their aggressive effect (antioxidative effect). Bilberry is a generous gift of nature to the inhabitants of northern latitudes. This berry contains numerous substances, which are necessary for normal vital activity of the body: organic acids (citric, lactic, oxalic, quinic, malic and succinic ones), vitamins (vit. E, B-complex vitamins, vit. C and PP, carotene complex), bioflavonoids (including quercetin, isoquercetin, rutin), anthocyans, tannins, carbohydrates, amino-acids (cysteine, glutamine, glycine), triterpenoids, phenols, polyphenols, catechins and essential oils. Bilberry has no superior in magnesium content. Modern medicine utilizes only one healing property of bilberry, viz. its positive effect on the organ of sight. Bilberry consumption improves blood supply of the retina, thus accelerating retinal tissue regeneration, improvement of mesopic vision, broadening field of vision and reducing eye fatigue. Anthocyanosides (flavonoids) in bilberry provide positive effect on the retina, preventing wear of this highly sensitive tissue and stimulating production of rhodopsin – a photolabile pigment of the retina, increasing its sensitivity to changes in light intensity. Under the influence of anthocyanides blood vessels walls are strengthened, their elasticity, as well as cell membranes flexibility are improved, inflammatory process development and clot formation are averted, metabolism at the tissue level is activated, blood supply to the organ of sight is improved, glaucoma development risk is reduced. Vitamin C provides for supporting colloidal state of the intercellular substance and normalizes capillary permeability. It regulates replenishment of visual pigments stock. 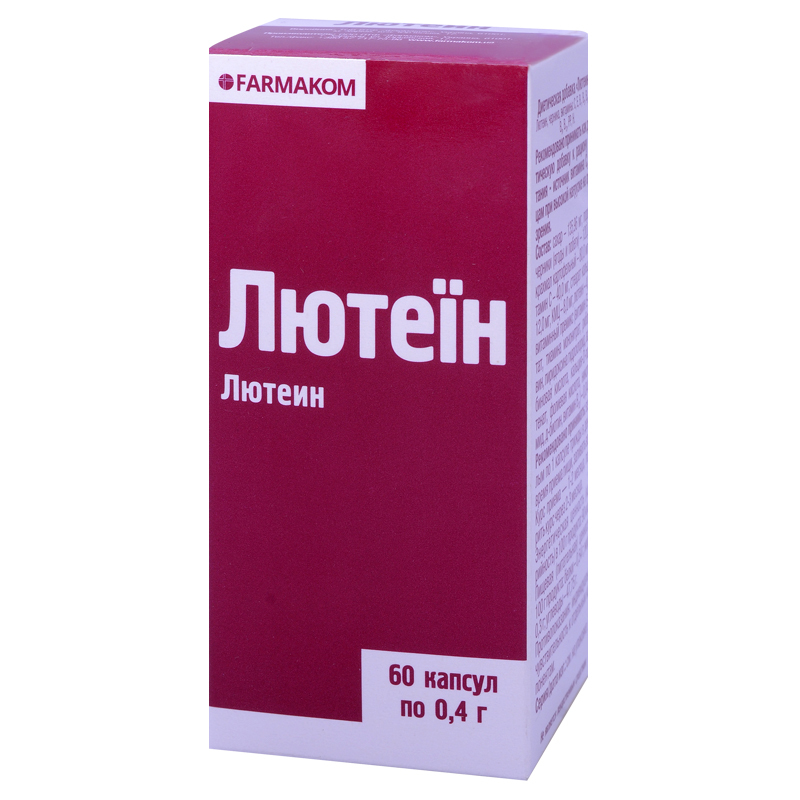 Complex of vitamins from vitamin mixture (Vit. E, Vit. B1, B2, B5, B6, B9, B12, C, nicotinamide, D-biotin) acts as a catalyst of numerous biochemical processes in the human body, it provides for improvement of immunodefence, decreases aggressive effect of environmental factors. Adults take 1 capsule thrice a day with food, wash down with water. Term of use – 1-2 months; retreatment is possible in 2-3 months. Proteins – 0,54 g, carbohydrates – 47,75 g, fats – 0,3 g.